Oh, what a difference 8 years makes. On that Mother’s Day, all that time ago, I stood alone and freezing on a race track I knew so little about. 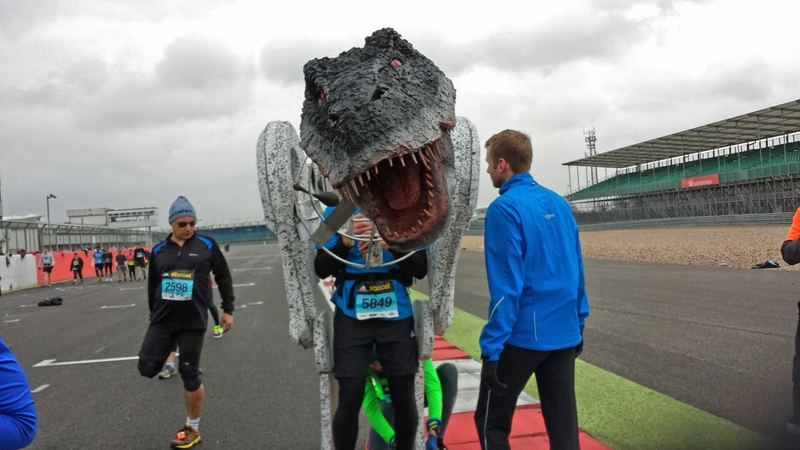 Fast forward and yesterday, also a Mother’s Day, I stood freezing with a dear friend who had never run beyond 7 miles and a fully grown male in a tyrannosaurus rex costume. 8 years ago I was one of very few females to be seen. 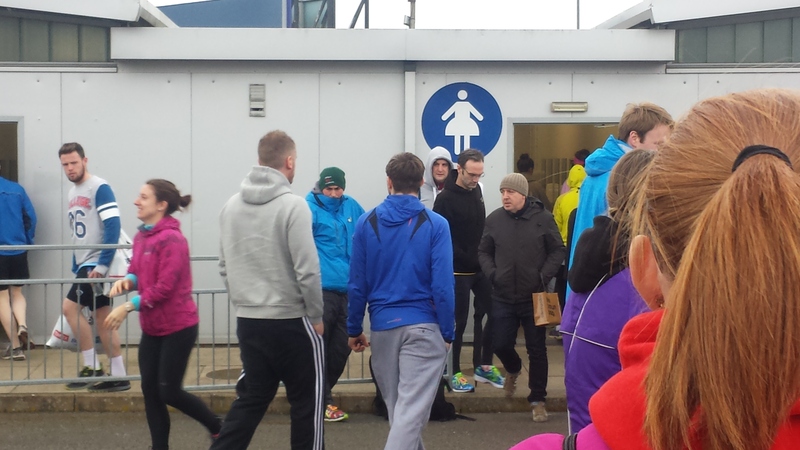 Yesterday the full glory of the “loo queue” with my fellow women. Shuddering and shaking as a team. Girl power. 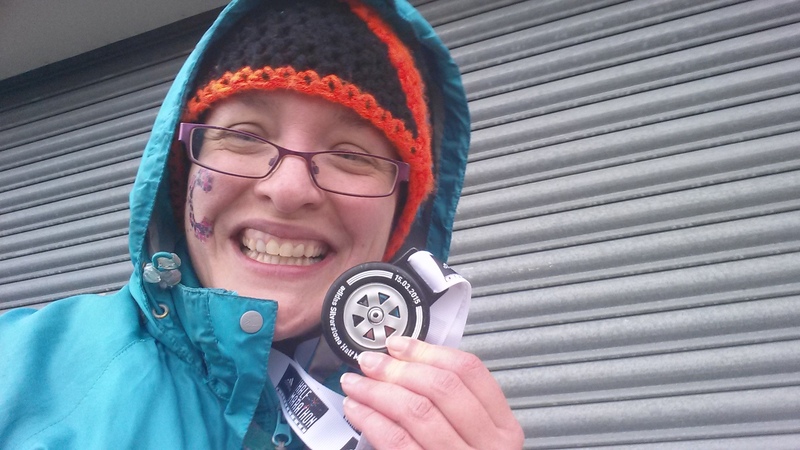 In the week leading up to the race I managed to get both a 24-hour stomach virus and a cough so terrible my husband seriously sat me down and asked if I should really go and run Silverstone. Thing is, I had to. I had to erase the miserable memory of that race. I had to see what 8 years had brought to something that sat so negative in my mind. But I had something very magical with me that helped me through. My first-time running, nervous-wreck but utter F1 enthusiast friend. For the first 5k he kept me focused on parts of the track. He taught me how to “run the race line” and noted portions of the track that were “notoriously difficult.” He recounted tales of where he stood when some event happened. Where a photo of his was taken. His joy, his utter joy of running down a track that he had more knowledge of then I thought possible got into me and carried me through. After I let him trot on ahead after the 5k I stuck to his race line advice and literally ran “ahead of the cough.” It was a cold, windy day and the threat of rain hung in the air, but I clutched to that magic. I looked at the bends and curves, noted the spots where, in the past, cars struggled. I smelled the whiffs of petrol and grease in the air and just kept putting one foot in front of the other. I was seeing this race differently now, seeing it with all the beauty that it was meant to be seen in. I was having a good time. He proved he could in spades. The thing I’ve picked up about F1 is just how tough it is. That there are races where cars don’t even make it to the start line simply because the team is constantly attempting to go that ‘one step beyond.’ That there are a million risks and a billion innovations happening all at once. Yesterday, I crossed the line of my 14th half marathon. I did it in perfectly good time. 8 years ago I was one of the last to cross. I was tossed a bag with a huge shirt in it and felt as if no one there cared. Yesterday I crossed into screams and congratulations. I was able to chat with race staff who were kind enough to guide me to my medal and my things. I got to hug my first-time half marathoner friend and cry happy tears. I got to raise money for Cancer Research UK. Silverstone is now officially behind me. I no longer hold a grudge. There will be other races ahead, some long, some short. And, thanks to my wonderful friend, I’m going to focus on that line on the ground, the magic of a tarmac, and look at the curves and bends and stop thinking about split times.